North American Box Turtle | Zoo Med Laboratories, Inc. Box turtles are one of America’s favorite turtles and can be a rewarding pet if given the proper care. Although they spend much of their time on land, Box turtles need constant access to shallow freshwater and high levels of humidity. Box turtles have fascinating personalities and will quickly begin to recognize their keeper. With a varied diet that includes every food group, feeding box turtles is easy. There are 6 species of Box turtles, however basic care requirements are very similar for them all. Always research the specific needs of your species. It is important to remember that turtles are long lived animals and many will live more than 20 years. Keeping a turtle is a long-term commitment and needs to be considered before purchasing. Please do not release pet turtles into the wild. Always buy captive bred Box turtles! Hatchlings and turtles under 3 years of age can be housed in a 20 gallon long terrarium. Box turtles will do best if kept outdoors in temperatures that do not fall below 50°F in winter. If being kept indoors, an adult Box turtle will need at least a 30 gallon terrarium. Zoo Med’s Tortoise House™ is an ideal enclosure to house this small species. The Tortoise House™ can be taken outdoors to provide natural sunlight when temperatures permit. Zoo Med’s Tortoise Play Pen™ is an excellent way to occasionally offer natural sunlight and grazing opportunities to your box turtle if being kept indoors. Zoo Med’s Basking Spot Lamp™, Repti Halogen™, Ceramic Heat Emitter, and ReptiTherm® Under Tank Heater are good choices for heating box turtle enclosures. Daylight Blue™ and Nightlight Red™ Heat Bulbs are a good supplemental heating source. Zoo Med’s ReptiTherm® Habitat Heater is a great choice for heating large enclosures, or outdoor turtle houses. The ReptiTemp™ 500R Thermostat and ReptiTemp™ Rheostat will help maintain proper temperatures. Always monitor temperatures closely with a thermometer, don’t guess! The new ReptiTemp™ Digital Thermometer will help you monitor specific temperatures throughout your enclosure. UVB Lighting is essential for Box turtles to process calcium in captivity. Without UVB lighting turtles will develop serious health problems such as Metabolic Bone Disease (MBD), abnormal shell growth and other deformities. Let you turtles have access to natural sunshine whenever possible, and always remember to provide a shaded area where they can retreat from the sun if needed. A mixture of Eco Earth® & Forest Floor™ is the most preferred substrate for Box turtles. We recommend providing a deep 4″+ of substrate to allow your turtle to burrow. We recommend providing a gradient of moisture for your turtle. This gradient can be created by keeping moistened New Zealand Sphagnum Moss and Eco Earth® in one corner, and drier Eco Earth® or Forest Floor™ on the opposite side. Your turtle will move between these areas as needed. Box turtles are opportunistic omnivores and will eat a wide variety of foods. Variety is the key to raising and keeping healthy box turtles. Insects, meat/fish, grasses, fruits, and vegetables are all part of a natural Box turtle diet. 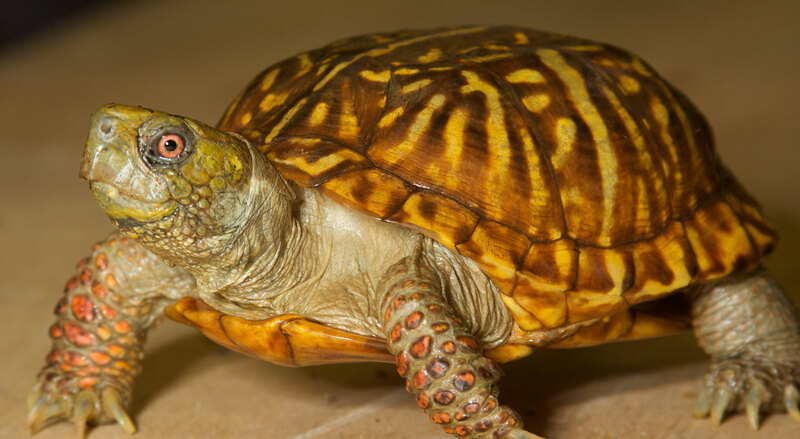 Ornate Box turtles are more carnivorous than the rest and will require more protein in their diet. Zoo Med’s Natural Box Turtle Food is an excellent maintenance diet for all box turtles. Add water and mix it into a mash. Adding live insects to the mash may help entice reluctant turtles to begin feeding. It is essential to supplement your turtle’s diet with ReptiCalcium® and ReptiVite™ as directed to provide balanced nutrition. Zoo Med’s canned Box Turtle Food is a vitamin and mineral fortified diet that can also be mixed in to our pelleted diet. Can O’ Insects make offering a variety of feeder insects easy and convenient. Fruit Mix-Ins are a great treat to be offered to box turtles and a great addition to your “mash”. The Aquatic Turtle or Tortoise Banquet® Block is a great supplemental food and calcium source. A Turtle Bone™ is also a great way to offer calcium and help maintain your turtle’s beak. Provide fresh water every day. Zoo Med’s Repti-Ramp™ Bowl makes an ideal water dish that allows your Box turtle easy access to fresh water. Make sure water levels are kept shallow to avoid accidental drowning. Treat all water with ReptiSafe® water conditioner to remove any harmful chemicals from tap water. Maintain humidity at 40-50% for adults, and 60-70% for hatchlings. Zoo Med’s Hygrotherm™ can be used with a Habba Mist® or ReptiFogger™ to maintain precise levels of humidity. Always monitor humidity levels using a hygrometer. Offering dampened New Zealand Sphagnum moss on the cool end of the enclosure will give your turtle a moist refuge for burrowing.